The warm goat cheese and crispy toasted crostini perfectly complemented one another, and we were sure to devour every last smidgen of cheese. 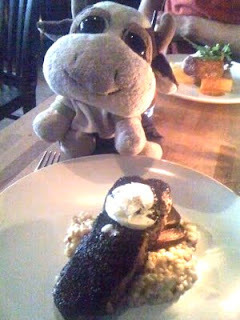 Next came the coffee smoked jalepeno crusted bison. The coffee crust gave the bison a delicious savoury kick of flavour. While the slightly crunchy barley risotto was enveloped in creamy and mouth watering sauce. The pork tenderloin was moist and juicy, while the accompanying polenta in tomato butter sauce was soft and partnered well by a sauce that allowed it to shine. This moo was treated to a beautiful glass of Crios Torrontes wine from Argentina by Chef Paul Shufelt, Vice-President Culinary and Corporate Chef of the Century Hospitality Group, who was also dining there that evening. The wine was smooth with just the right hit of sweetness. Thanks Chef Shufelt! Dessert consisted of an apple cinnamon walnut bread pudding. Surrounded by a salted caramel sauce and an airy brandy whip cream, the bread pudding had more of a smooth cake texture. The only downside was the overly large pieces of walnut that seemed to scream out and call attention away from the creamy cake. 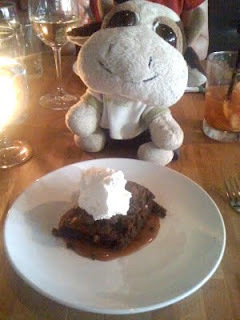 The flourless chocolate brownie with salted caramel and whip was decadent, dark, and rich. This place is a neighbourhood gem and we will definitely be returning to work our way through the rest of their menu. If you go, I highly recommend that you do not miss their iced coffee with Bailey's and their flourless chocolate brownie, or you will be sorely missing out!